This is the Ruby version of my Cylon LED test cycler that I’ve written in various languages on Arch Linux and the Raspberry Pi. This time it was Ruby’s turn to see if I could use it to manipulate the various I/O subsystems on the Pi. Since setting output pins to drive LEDs is the easiest place for me to start, I wrote the code you see above. Before I could make it work I had to install the rpi_gpio gem. To get some idea of how to use it I looked at the GitHub repository for rpi_gpio. The reason for this is to be able to bridge between the Ruby on Rails work I started earlier this week with both input and output I/O. The only other comment I will make is to make sure that the udev rules have been set up to manipulate the I/O as a regular user. Trying to run the code shown above as root will fail, as the installation of rpi_gpio was local to a regular account, not globally installed. My only comment on rpi_gpio so far is this: I discovered I had to code a set_low immediately after every enabling of a pin as an output, as the pin was enabled high. I consider this a bug, and as it stands it may not be suitable for what I need. If even a microsecond pulse goes out from those pins after being enabled by Ruby then that’s enough to cause a false start on that pin. The Ruby code isn’t something to write home about, just something to do some very basic testing. I’ve been asked to create a web monitoring application running on a Raspberry Pi (in this case the 3). The requirements are very modest; run a low-traffic web page to monitor another machine next to it, and provide a simple web report on demand across local WiFi. For this particular project I’ve elected to go back in time, as it were, and install Ruby and Rails as the web foundation. And when I say back in time, I’m talking 2007, when I created another embedded system using a milliwatt CMOS 486 clone chip running a custom built Linux kernel with µclib and BusyBox running Ruby and Rails. 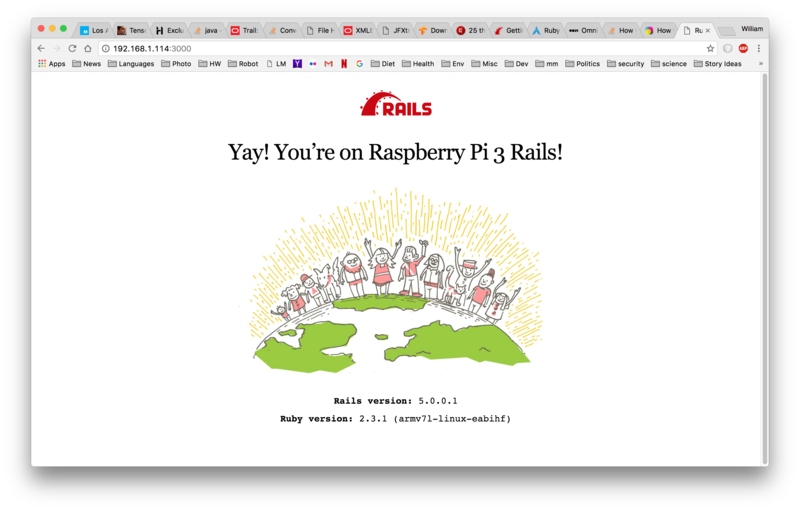 This small post documents the steps, in order, for installing Ruby and Rails peculiar to Arch Linux ARM and the Raspberry Pi 3. First, make sure that Ruby is installed. That’s as simple as ‘sudo pacman -S ruby’, and for the documentation, ‘sudo pacman -S ruby-docs’. Ruby Gems are a part of Ruby, and you can look to see if they’ve been installed with either a ‘gem -v’ or by looking down /usr/lib/ruby. Log out, then log back in. Make sure to do all this before you install Rails, or else Very Bad Things will happen when you do install Rails. It took two attempts to install Rails, all because I failed to add that line to my bashrc file before the first attempt. You can read all about RubyGems setup here. Third, install Rails with ‘gem install rails’. This will install an account local copy of Rails under ~/.gem, specifically ~/.gem/ruby/2.3.0/gems with this version of Gems. Installing a local account copy is no different than what happens with Node.js installations. There’s always a debate about local vs global installation; due to security and my personal paranoia I always prefer local (non-root) account installation to minimize any unintended consequences a global installation might engender. The merge binds the web server to whatever IP address DNS assigns to the Raspberry Pi (‘0.0.0.0’) instead of using localhost as the defult, and changes the port from the default of 3000 to 8081. Finally, and this is just extra, I made a tiny modification to the default index file at ~/.gem/ruby/2.3.0/gems/railties-5.0.0.1/lib/rails/templates/rails/welcome/index.html.erb to add the text “Raspberry Pi 3” in order to drive home that the default web page was in fact coming from the Raspberry Pi 3.